“On TV And Video” is a column exploring opportunities and challenges in programmatic TV and video. 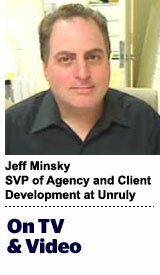 Today’s column is written by Jeff Minsky, senior vice president of agency and client development at Unruly. It’s rarer to find multiple tech sectors applauding the Federal Communications Commission (FCC) for any action it takes than it is to find an Alakazam and Scyther within a two-block radius while playing Pokémon GO. But that’s just what happened 2 weeks ago when the FCC opened up a significant new spectrum for the next evolution of wireless data communication, 5G. Telcos and cable operators alike praised the move, which opens up 11 gigahertz of spectrum above the 24GHz band. Why is 5G so significant? In the US and in many parts of the world, users connect to the internet at speeds meeting the barest definition of broadband. Yet, we are on the precipice of an incredible bandwidth leap, which carries significant implications for digital video advertising. Every major shift in media consumption since the digital era began in the late ’90s has been predicated upon a shift in bandwidth. The shift from 4G to 5G will be a doozy, enabling download speeds up to 10 times that of current 4G, which currently maxes out at 1 gig per second but rarely achieves that speed. At 4G speeds, a 4K movie would take an hour to download. At 5G speeds, it would take less than 10 minutes. At 5G speeds, video will be as fast as Star Trek’s Universal Translator, which, for those of you who are not Trekkers, enables instantaneous language translation. Dynamic video creative becomes even more compelling and possible across multiple screens, including TV, because lag times can be reduced to near imperceptible levels. Augmented reality and virtual reality content will be able to be streamed from the cloud, instead of needing to be stored locally, to provide photorealistic experiences. Additionally, 5G will speed up the adoption of driverless cars, improving safety and reducing collisions with faster data feedbacks. In an Internet of Things environment, we can expect to see an exponential growth in the input stream, allowing for greater predictive data that will power the insights driving both data scientists and AI to make smarter marketing decisions. In a sign that the worlds of cable and telecommunications are continuing to collide, and maybe just too coincidentally on the heels of the FCC announcement, Comcast unveiled the official formation of Comcast Mobile, a partnership where Comcast will act as a mobile virtual network operator using Verizon’s wireless infrastructure. While Comcast will continue to upgrade data and video delivery across its cable infrastructure, it clearly sees that a good portion of video consumption will flow wirelessly through 5G and does not want to get cut out of the revenue this will generate. Subsequent to the FCC ruling, the White House announced the Advanced Wireless Initiative, a $400 million research project led by the National Science Foundation, to build four “city-scale” testing platforms within the next 10 years. In partnership with Intel, much of this will be done to develop Internet of Things municipal projects powered by 5G. In another ruling by the FCC that didn’t catch the same attention as the spectrum announcement but is almost as significant, the FCC also blessed the death of the copper landline, allowing telco providers to twilight the analog technology without fear of repercussions. Sometimes legacy systems do die. Consumers should not expect to see 5G roll out tomorrow. It will likely begin to hit in mid- to late 2017, and the rollout will be measured. Yet, the step taken by the FCC is incredibly significant, and it’s a sign that the US wants to be a leader, not a follower, as it was with 4G. For buyers and sellers of digital media, this move, along with the continuing rollout of DOCSIS 3.1 and Google Fiber markets, confirms the move to a hyper-broadband environment that will hasten the twilighting of narrowband ad units, such as traditional banner ads. It will also continue to drive greater distribution of HD/4K video experiences and cement video as the leading digital ad unit in the years to come. In turn, it’s only natural to assume that the metrics and KPIs used by many marketers for narrowband will need to dramatically evolve, to account for a world where storytelling and emotional brand impact is a key focus, not simply the bridge to transaction that the old narrowband web provided. Follow Unruly (@unrulyco) and AdExchanger (@adexchanger) on Twitter. ← What else is out there?